Learn how officials are working to keep Galveston safe during Mardi Gras festivities. GALVESTON, TX (KTRK) -- With nearly 400,000 visitors expected, Galveston's Mardi Gras festivities are among the nation's largest. This year, there will additional security measures, which may go unnoticed by those partying. Events in Europe last year, which saw pedestrians struck and killed when terrorists used stolen trucks as deadly weapon in attacks in France and Germany, prompted the security enhancements. "We're taking appropriate actions to make sure we're doing whatever we can to safeguard all our attendees," said Lt. Joshua Schirard with the Galveston Police Department. Concrete barriers have been placed around the perimeter of the 10-block event's entertainment district. "We added Jersey barriers to those, so once the concrete barriers have been dropped, it's very hard to get any vehicle in and out of the event, which is the goal," Schirard said. Bomb sweeps were conducted in the area around vendor booths earlier. Detection canines trained to find explosives also inspected the area. More sweeps will be made even as Mardi Gras is underway. The area has also been designated a no-fly zone for drones. Another security feature has been added to the event by the City of Galveston, which purchased new software for it. It's a text alert system especially for Mardi Gras to warn people of a public safety threat. Dial 409-515-8010, and type the word 'add'. You'll be notified in the event of an emergency. "If we have an issue down in the entertainment district, we'll ask festival-goers to evacuate, but we hope we don't need to use it," said Jaree Hefner, spokesperson for the City of Galveston. The day-long celebration of Hispanic heritage includes three live entertainment acts, including a performance by Grammy award-winning headliner La Mafia. 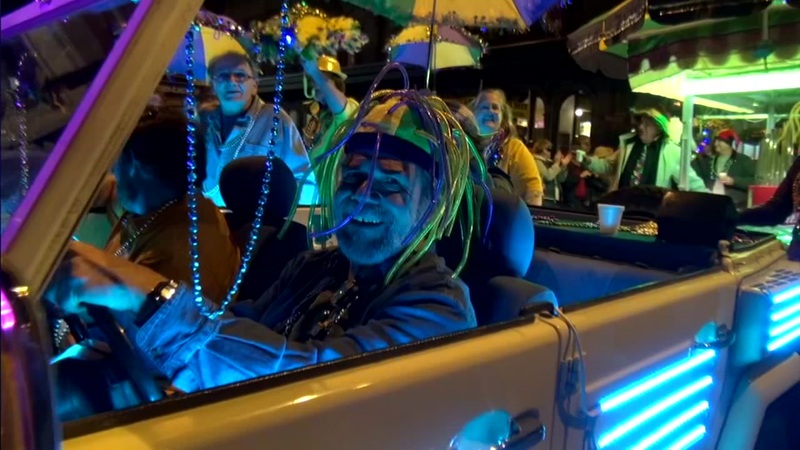 PHOTOS: Mardi Gras lights up the night in Galveston!